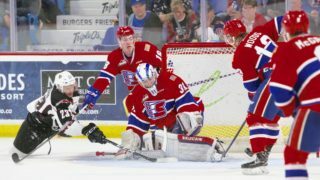 Goaltenders Donavan Buskey and Declan Hobbs combined to make 34 saves in 36 opportunities and led the Spokane Chiefs to a 3-2 victory over the Tri-City Americans in WHL pre-season action on Saturday night. Buseky started the game and stopped all 10 shots he faced in 30:31 while Hobbs was 24 for 26 in 29:29. 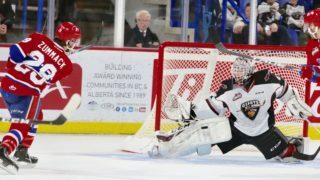 While on the power play, the Chiefs’ Ethan McIndoe scooped home a rebound at the top of the Tri-City crease and scored lone goal of the first period at 2:37. Rookie defenseman Eric Van Impe and import Milos Fafrak assisted. 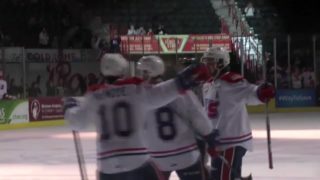 Rykr Cole’s snap shot from the right circle 4:00 into the second pushed the Spokane lead to 2-0. Dalton Hamaliuk and Nolan Reid assisted. Reid’s slap shot from inside the blueline 7:36 into the third was the eventual game winner and Spokane’s second power play goal. 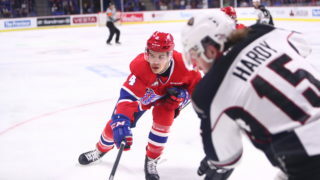 Hamaliuk and Fafrak earned their second assists of the game. Nolan Yaremko scored both of Tri-City’s goals, at 16:50 and 19:49 of the third. Spokane was 2-7 on the power play and 6-7 on the penalty kill. The Chiefs will return to Tri-City next Saturday night to finish their seven game pre-season schedule. 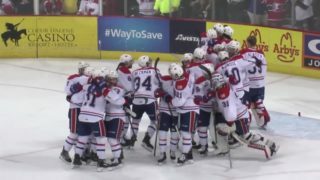 Spokane is now 3-1-0-2 on the pre-season. The Chiefs will begin the regular season with a pair of road games in Prince George on Friday, September 22nd and Saturday, September 23rd. Bud Light Opening Night and Pre-Game Party will take place on Saturday, September 30th versus the Kootenay Ice. 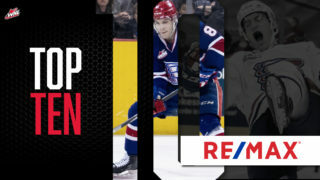 Tickets are currently on sale by calling the Chiefs office at (509) 535-PUCK or logging onto www.ticketswest.com.